Thank you Paleophilatelie! Wow, a FDC with everything! The Upper Paleolithic site of Mezhirich may be the site shown on the right stamp of the s/s, or a composite of similar sites found in the Ukraine. 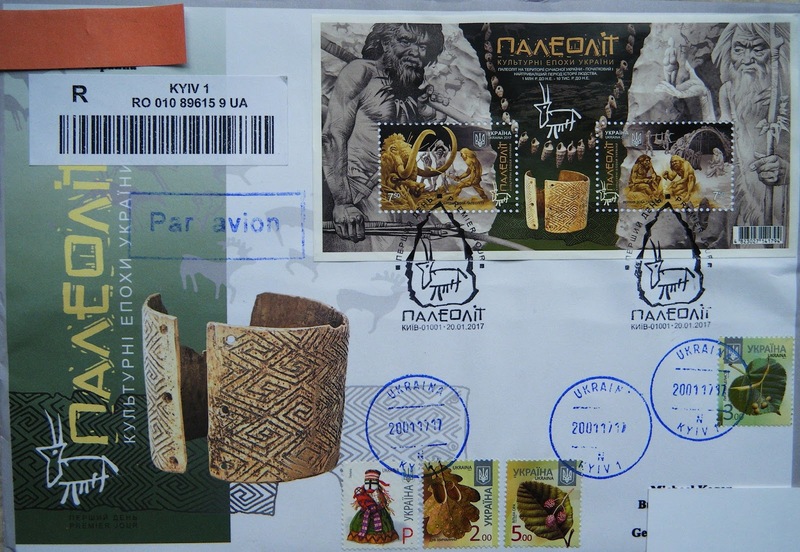 At Mezhirich, dwellings were constructed from mammoth bones which can been seen in the background of the right stamp. The weight of these structures was about 40,000 lbs of bone, not including the earth and hides which were likely added. More mammoth bone was found in pits and hearths, from meals and for fire starter. The bracelet on cachet is made from, you guessed it...mammoth ivory! It is the Mezin wide bracelet and is displayed at the Museum of History in Kyiv. Issued: January 20 2017. Thank you Emily for this postcard! This mammoth mired in mud is a reconstruction of how these animals perished in the Dyje River swamp. 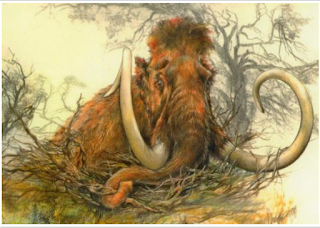 Major camp sites along the Dyje utilized mammoths as a food, tool, and raw material resource.